9 foot stake Key West is probably not the most famous of the Key West diving sites, but it certainly has a lot to offer lovers of this sport. You might be wondering how it got it’s somewhat unusual name, and maybe you don’t care a less. But I’m going to tell you anyway, because that is what I’m like. Within the reef you will be able to see a fallen telephone pole lying below the waves, which is you might have guessed about nine feet in length. I have tried to find out how the pole got there and have no idea. So if anyone has an answer to this question, please contact me and I’ll add it to the page. Anyway back to business…if you want to dive down to this site, you will need to make your way across to Marker 32, and about 4 miles south of Key West you'll find 9 foot stake reef. There are lots of charters around that will be more than happy to take you out across the water for a charge, but best of all is if you have your own vessel. Then you can stay around as long as you want, by mooring your boat to one of two buoys. The nine foot stake site is great as a second or even a third dive of the day after visiting the more impressive Cayman Salvage Master. 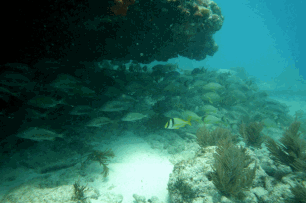 Many people find 9 foot stake Key West particularly appealing when trying underwater photography for the first time, as the water is very shallow and clear, with a good variety of fish around. Don’t be surprised if you don’t see hogfish, bar jacks, and even the odd barracuda zip past you. I have even been told that many divers have had visits from extremely interested and playful sea turtles, which hover around you as you dive. That is fantastic to see, as so many of these amazing creatures get injured each year, which is why the turtle hospital in Marathon is so busy. But its not just for divers though, as the beauty of this site is as its so shallow, scuba divers and snorkelers will all get great enjoyment looking at what is going on under the waves. If you are going to go and find the actual wreckage of the stake then look around under the water for things like iron bars, and pilings and other stuff that the fish and marine life use for home, and there you will see the reef naming item. There is also the remains of a twelve foot lighthouse too, which once again provides a great place to hide for the marine life. For more information use the dive site maps located at the Florida Keys National Marine Sactuary, and then you wont go wrong. Also for a good company that specializes in diving around the waters of Key West make sure you check out the Key West Dive Center, who will be able to make all the arrangement's to ensure that your dive is a good as it can be.